Love the purse. Show us the chicken. Don't keep us in suspenders. The purse is adorable. Love the tiny friend....headless chicken? I have to come back for that? that purse is the cutest thing ever! what a clever, clever idea!! as for the leaving of things to the last minute I have just finished cutting out my apron for tie one on this month and plan to buy socks tonight for the monkey. so, I know just what you mean! Love the purse. Can I have one? That kitty purse is adorable!!! Thank you so much for finding me and leaving a comment. The feeling is mutual. All I can say is CUTE, CUTE, CUTE! Amazing detail! That MUST have been time consuming with all those teeny pieces. To go from a sketch to the actual thing?! I admire your ambition, creativity and determination! Wonky is cute! oh my! wonky is giving me heart tickles just looking at her! she is JUST adorable!! what will you do with her? (maybe, um, she would like to come visit someone like me?) such a cool idea too! i love how she opens up and her arm snaps into place! genius. That is soo cute!! I would love to have one!! Great job! Is it felt or wool? Oh, that is *so* cute! I can't believe all the details you included and how creative you are with her key-holding tail and snapping arm! Wonderful! Lordy, that is totally amazing. And that little mouse is astoundingly cute! Lost for words - almost. So cute, beyond cute. I love the tiny mouse, too. So clever. oh my. this is just wonderful. she is just sooo lovely! the sweetest purse ever! i love her nose, her mouse, even the colour just fab! aah bless! Its good to be wonky! can't wait to see the elephant!! Ha! You did it so soon - what a wonderful creation. It's great to see the 2d image come to life - and he's so practical too! I am so impressed with your innovation. Oh, it is so beautiful! I just love this little cutie pie face! Even cuter in person! Turning out all those little parts must've been a job for you. This is so well crafted, just amazing!! That is such a clever idea! And how did you know orange is my favorite color?!? ah that's brillient! it's the cutest thing ever. oh my gosh. This is so amazingly gorgeous. You're site is so inspirational. Thank you!! that is one super cute striped kitty!! OMG, this is one of the cutest things I've ever seen! This little pocket bear is amazing. He is cute and functional - the best of all possible crafts. 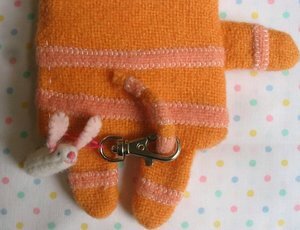 I love the he's orange and I love his little tiny bunny friend! Excellent. Oh my goodness that is the cutest kitty ever and so very clever too! Wonderful and amazing job! oh, she is too cute for words!!!! love it, especially the little bunny! i surfed in off of wee wonderfuls. Oh my goodness! This is the most awesome thing I have ever seen! I also found you through Wee Wonderfuls! How I never knew of your awesome existance before now, I don't know. Like everyone else has said - ADORABLE. One of these would cure me of my anti-purse attitude for sure! 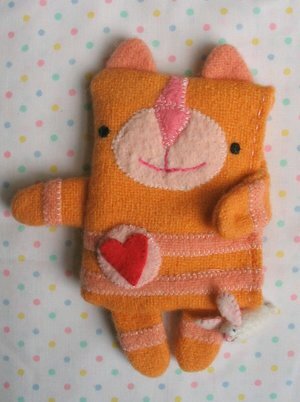 i love this purse cat.... would you like to make a swap???? super cute! was there a book you got the idea from or a pattern? i love it! 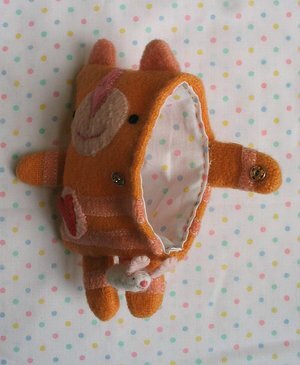 i hve a coin purse with a similar feel i got at a japanese toy shop. Cool collection. Learning with you. Can't stop adding your blog in my list. God bless you.